Make sure each character’s personality is different from that of every other character. You don’t want all your characters to behave in the same way or talk like one another. They’re people, not automatons. If each is like the others, none will seem real. And if your characters don’t seem real, your reader won’t care about what happens to them. It’s hard for your reader to relate to a wimp or a pushover. If your hero doesn’t care enough about his cause to assert himself to achieve it, why should the reader care enough to read about it? Make your hero a doer, not a watcher. If he just stands by while somebody else solves his problems and overcomes his obstacles for him, he’s not much of a hero. Your reader wants a hero who rises to the challenge, faces his problems head-on, overcomes adversity, and either achieves his goal or becomes ennobled by his effort to do so. Put your hero in the driver’s seat, literally and figuratively, at every opportunity. Go back though your list of traits for each character. Have you created a dumb blonde, a mad scientist, a brutish albino hit man, a crooked sheriff, or any one of dozens of character types that have been done to death in books and movies? Take your dumb blonde and make her not dumb or not a blond. Make your mad scientist not mad or not a scientist. Consider a western with a stereotypical crooked sheriff. He owns the town, rules by fear, accepts bribes from criminal elements, and has the judge in his back pocket. Too cliché! When I find a cliché character in my own writing, I play “What if…” or “Suppose…” These words help me brainstorm ideas to twist my character until he no longer feels cliché. For example, suppose the sheriff is a woman. Suppose she’s corrupt in actions, but not in motivation. Suppose she was made sheriff by her father, a powerful and corrupt politician who not only threatens her life, but that of her children as well. Suppose she must find a way to overthrow her father’s influence in order to free herself from his web of corruption. You see how it works? More subtly, do you have an otherwise-original character who exhibits a single trait that’s a cliché for his character type? The brutish hit man who happens to be albino might fall into this category. Albinos are certainly rare, but in literature and movies, they almost always appear as brutish villains. Move this trait to a sophisticated good guy, maybe even the hero. How might that affect his life, the way people treat him, or his opportunities for social, political, or economic advancement? Is his society tolerant of such aesthetic differences? Does it hinder him in his quest? Here I must make a distinction between realism and cliché. What if you create a 10-year-old boy who never cleans his room? Is he realistic or cliché? Here’s my test: Do most real ten-year-old boys live in dirty rooms, or do most keep them clean? I suspect the former. If so, a character with this trait is realistic. He should have some trait that’s unusual for his demographic, however, so he doesn’t feel to the reader like a cardboard cutout. If most real ten-year-old boys live in clean rooms but a high percentage of fictional ten-year-old boys are characterized by dirty rooms, a ten-year-old boy with a messy room falls into the realm of cliché. By contrast, are most sheriffs really corrupt, or are they just portrayed that way too often? In this case, the latter is true. This is what makes the crooked sheriff, the dumb blonde, the mad scientist, and numerous other character types clichés. Apply this test to each of your characters. If you find a single cliché trait in an otherwise-original character, one solution is to replace the trait with its opposite. Do what the reader won’t expect. The waiter, the cab driver, the shoeshine boy, and other characters who appear fleetingly need not be fleshed out as completely as your main characters, but that doesn’t mean you should leave them as cardboard cutouts. Give each character at least one interesting trait. It’s not enough for your characters to be realistic. Make sure each one is both unique and memorable. Kirt Hickman is a technical writer turned fiction author. 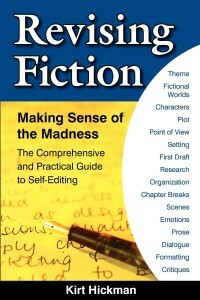 His books include three sci-fi thriller novels Worlds Asunder (2008), Venus Rain (2010) and Mercury Sun (2014), the high fantasy novel Fabler’s Legend (2011), and the writers’ how-to Revising Fiction: Making Sense of the Madness (2009). This article was originally published in the August 2009 issue of SouthWest Sage and is reprinted here by permission of the author.